Orientation has been pretty busy; most of the day is spent in seminars on topics ranging from cross-cultural experience to dealing with violence abroad. Today we got a break. Roy, Emily, Caitlin, and I, along with Christina who is going to Ghana with Catholic Relief Services, took a day trip to Chicago. We saw the amazing Body World exhibit at the Muesum of Science and Industry, ate Chicago pizza at Giordano’s, and walked around the downtown area. 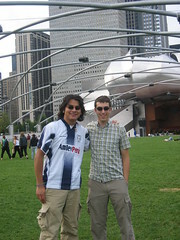 To the right is a picture of Roy and me in Millennium Park. I had not seen it before; it’s a nice, relaxing place to put in the middle of an otherwise busy city.